I just read a book called "Cremona Violins" written about William "Jack" Fry. It contained some interesting history, some physics, and many dubious claims. The thesis of the book was that the cremonese masters must have adjusted violin thickness on the inside after completing the violin (varnish, etc). To keep the thread from spiraling out of control, I wanted to ask specifically if anyone has tried this method. In the book, many grand claims of graduation measurements were made, and the author (not Fry) asserted that Fry saw the same internal scraping tool at the museum in Cremona. You too, apparently, can take an old german violin and produce a del gesu in sound (sarcasm). As a fellow scientist, I found Fry's claims to be unscientific, but I was curious from makers on MN, does anyone actually adjust sound on a finished instrument this way, or does one focus more on traditional setup at that point. For what it's worth, I'm completely happy with my violin, and I'm not expecting to suddenly transform it with a coat hanger and some sandpaper. I don't know of any renowned contemporary makers who use Fry's method. As a scientist, I found gaping holes in Fry's logic big enough to drive a truck through. As a maker, I found that even fairly severe regraduations only had limited tonal effects, so I didn't think that little piddly scraping as described by Fry was even worth following up... in addition to the problem of it being logically faulty. I focus on the wood and the arching mostly, graduations less so. Then after it's put together: setup. 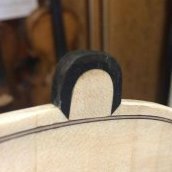 If there is excessive stiffness to the instrument, then I'll open it up for messing with thicknesses... but that been necessary on my last several instruments, and certainly not something I'd attempt thru a soundhole. Thank you both. I'm a chemist and the science behind his assertions was dubious, I just wanted to hear from some well-respected makers as well. David's recent comment about time/age being a major factor is probably one of the biggest--and hardest to test--factors in why old violins sound so good. That, and psychology. Aha! that's because only the old italians used this method! When i first saw his video about this asymmetrical graduation, it sort of made some sense to me. With a bit of imagination you can see it also on some graduation maps of old italians. But when he demonstrated before an audience how a few swipes with sandpaper on a piece of metal wire on the inside made such a difference, i got some serious doubts about his methods ..
For what it's worth, I'm completely happy with my violin, and I'm not expecting to suddenly transform it with a goat hanger and some sandpaper. To answer your question: i think i tried it on my #3, but as didn't have much clou about making violins (and still haven't ) it's difficult to say if it did something, there are so many other variables to mess up ..
And the audience was too polite to not go along for the ride. This is the epitome of the homeopathic theory of violin adjustment. This is new to me, I've seen goats climb trees however. At the city farm they always try to eat your sleeves, maybe a green shirt was a bad idea. And the audience was too polite to not go along for the ride. That's what I get for posting from my phone! I'm going to leave it, for comedic value. This is the epitome of the homeopathic theory of violin adjustment. That matches exactly my experience, almost no matter how extreme regraduation you are doing, there are only minor response and tone differences. Hi devaraja42 - so that what Stradivarius "punch-machine" was really used for. The engineer in me can see the logic in first carving the inside (using a chain to obtain a smooth flow), then shape the outside to a constant thickness using Anthony's punch machine, assemble the body and tap tuning the outside by scraping. Doing it this way could explain the assymetric thicknesses that have been noted. Furthermore it would need no arching templates at all as the final shape of each body would be a direct function of the wood properties. You too, apparently, can take an old german violin and produce a del gesu in sound (sarcasm). Now that's just silly. Anybody can see most of them look more like Amatis. You're right, but maybe he meant a cheap not quite so old German violin from Markneukirchen, not an expensive really old German violin from Stainer or even Klotz. Yeah. It's a witchdoctor version of David's fake out sound post adjustments. But with the witchdoctor believing his own nonsense. Agree with your post here edi..... because during a recent visit with Evan we managed to improve an old trade fiddle of mine that I could not play for more than a minute. He scraped away a little on the neck and bridge while explaining his method. It was very convincing to my ears and the fiddle now is much better sounding. He also brought along two of his unvarnished fiddles and was able to scrape the outside of the plates in different places while explaining what to listen for. His method seems to follow what a few makers here have posted over the years of tuning the outside of the plates after the box is closed. I think I first heard of this method from Oded Kishony's old posts. In case nobody noticed, a violin is very different from a bell. With regard to outside tuning, during some old threads on similar matters, I messaged back and forth with Oded about it some. I've meddled with it a little bit, but doing it on old fiddles leaves you with major refinishing, so I haven't done much of it. IMHO, it will certainly change tone. My feeling is that it's something that takes a lot of experience and a talent for doing, but definitely might have been practiced in "Old Cremona". I find the concept intriguing. I'll note that surface trimming the outside has nothing to do with Fry's interior prestidigitation with sandpaper. Yup. You certainly can't cast cannon from violins. 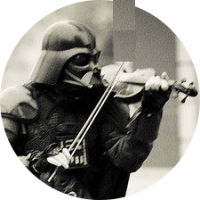 Violin can be as good a psyops weapon as that cattle slaughtering record though. 1.0 "major refinishing" - tuning the body during the making stage doesn't involve any great changes.If anything, it's probably quicker to tune to the "tap" than carve to predetermined thicknesses. Knowing what to tune to and where to tune it may well be "The Secret". 1.1 I suspect that varnishing -then becomes the final tuning step. 2.0 "surface trimming" vs "Fry's I P" - actually they are exactly analogous. Stiffness is proportional to the thickness raised to the third power - so a little difference goes a long way. For example assume a thickness of 3.4mm, then thin it by 0.1mm to 3.3mm - the stiffness will change by 8.6% which is not a small amount. It might be useful to note that the frequency change from A - 440 to A# - 466.1 is about 6%. The stiffness will care not a hoot whether the change comes from the inside or the outside. 3.0 "Bells and violins" - since both vibrate to create sound, they do share some things in common. 4.0 On "casting cannon from violins" - one could seriously consider casting violas from a cannon.